In such a lovely wet week the only downside for me was that I didn’t choose times for a walking/unfurling my tight back muscles – I’d look out, see the sun, quickly finish a section of work and then be greeted by the dismal wet grey sky. 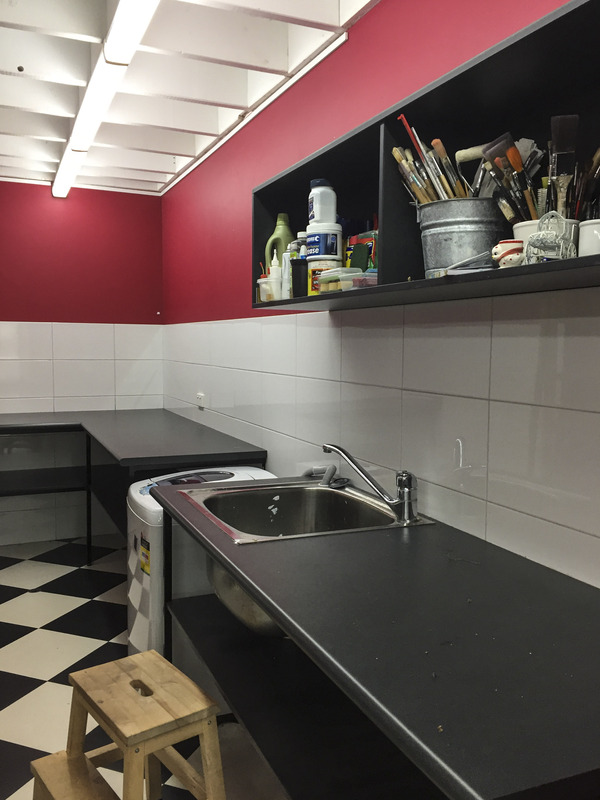 The BIG task for the week was a re-paint of the studio laundry and kitchen areas. After twentyONE+ I bought the leftover paint and duly repainted the studio lobby area charcoal and the bulk of the north wall, behind shelves and the design wall, white. 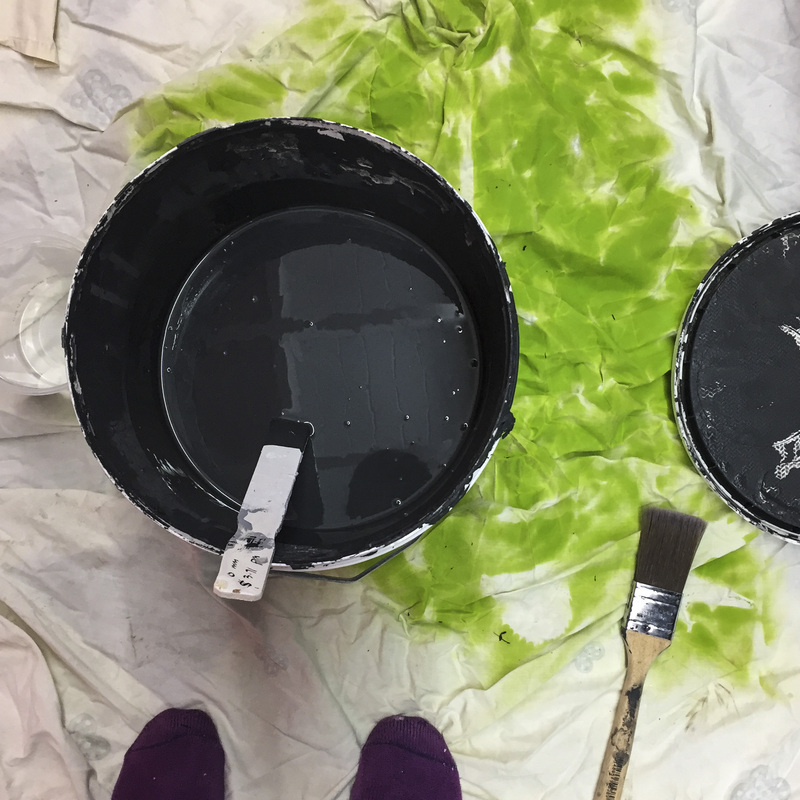 Freshening up the studio colour, in fact removing the studio colour and replacing it with two background non-colours was the tonic I needed a year ago. Alas I could not ‘afford to spend time’ on doing the whole studio – an upstairs and downstairs area that is equal in size to our home next door but also, importantly, the studio was, but slowly less so, chokkas with ‘stuff’. Simply put, it was dauntingly difficult to empty shelves, paint, clean, edit and RE-place the ‘stuff’ week after week. That is how I remember it anyway. On Tuesday I carefully emptied the laundry area. The studio tables, and under the tables, were loaded except for two tables left with the sewing machine and cutting space set. Miff was due to stitch on Friday whilst I looked after Flick. 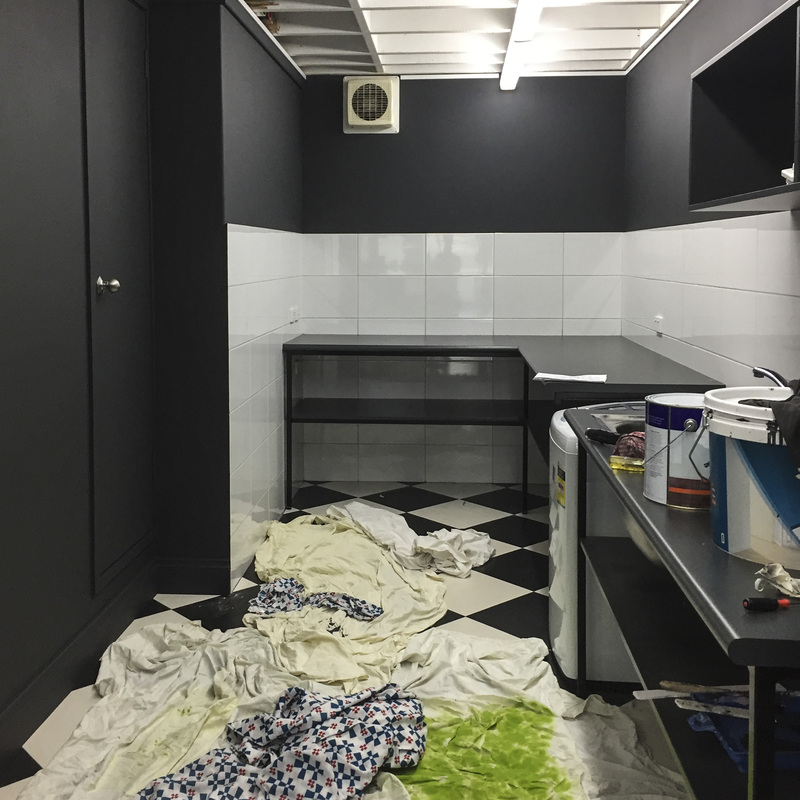 With the week ended and the laundry and kitchen area now repainted I am VERY Keen to keep going but it still has to be a section at a time. As I write this I am still in quandry land. I can choose to cover myself – as I am a very messy painter – in white or charcoal and mess up my clean studio again this week for paint progress – or I could choose to stitch? 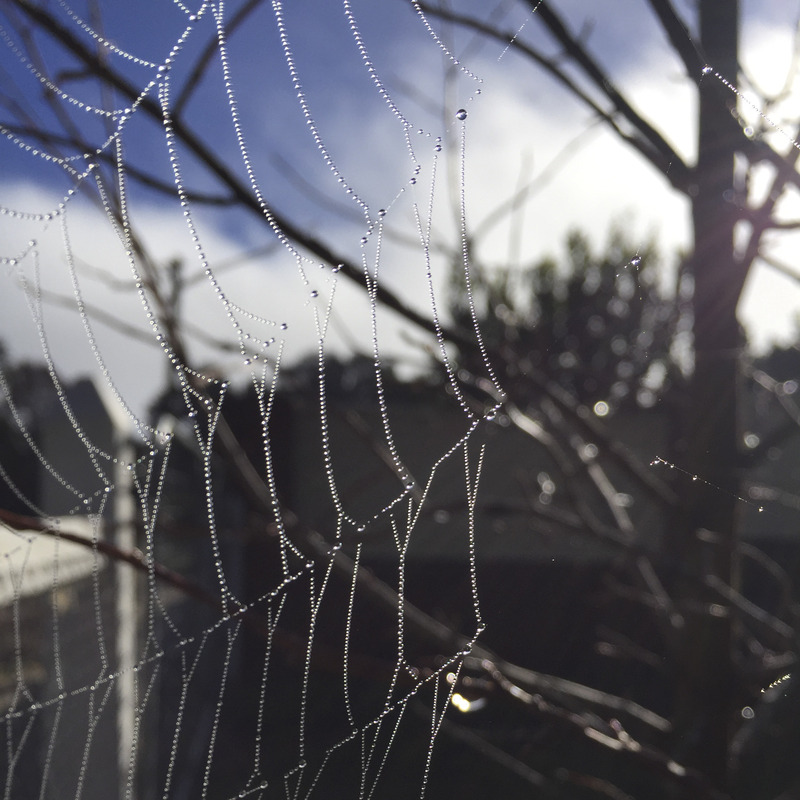 At chilly Dwelly on Saturday I was met at the gate by these jewelled webs. 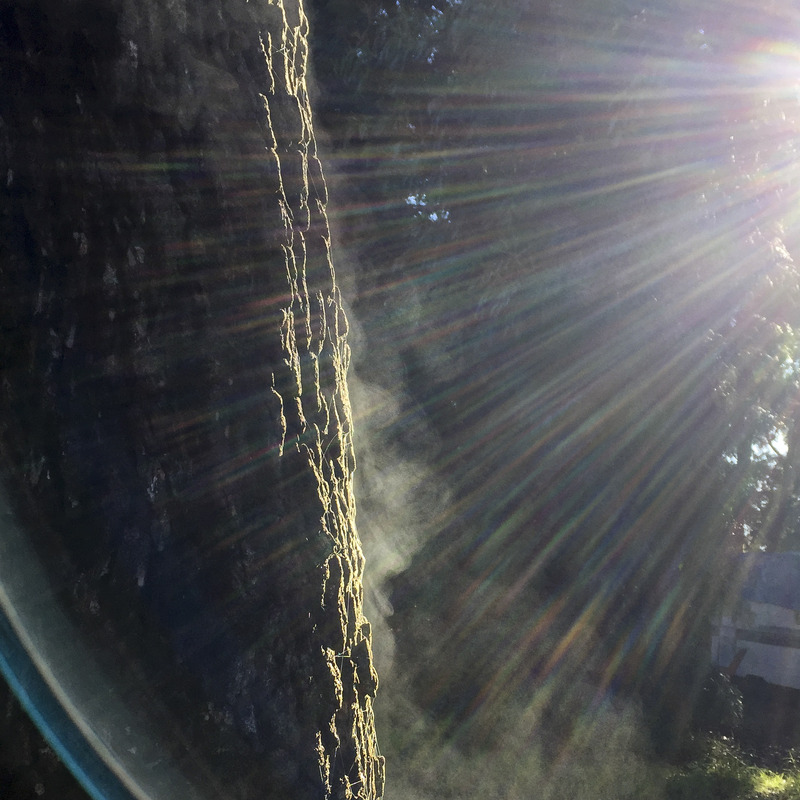 Out the back the smoking Jarrah trees were another beautiful sight with the sun’s rays working their magic in the lens. The weekend, actually mostly Saturday, was spent again in front of the kitchen fire working on the linking triangles for the homespun woollen ‘one block wonderz’ rug that I worked on last weekend. I completed all but fourteen of the triangles as I didn’t have enough whole knitted fabrics. I scrimped and patched but in the end I was still one measly triangle point off being able to complete these ‘broken’ triangles. Disappointed, but hopeful that I would locate some scraps back in the studio, I packed it all away to work out in the sun – feeding a Kookaburra worms as I raked the remains of the firewood delivery. What looked like a mound of mud and rubble was, in fact, wood splinters and bark covered in mud that the digger had picked up under the wood pile. Recent rain had cleaned the mound and finally allowed me to complete this task. 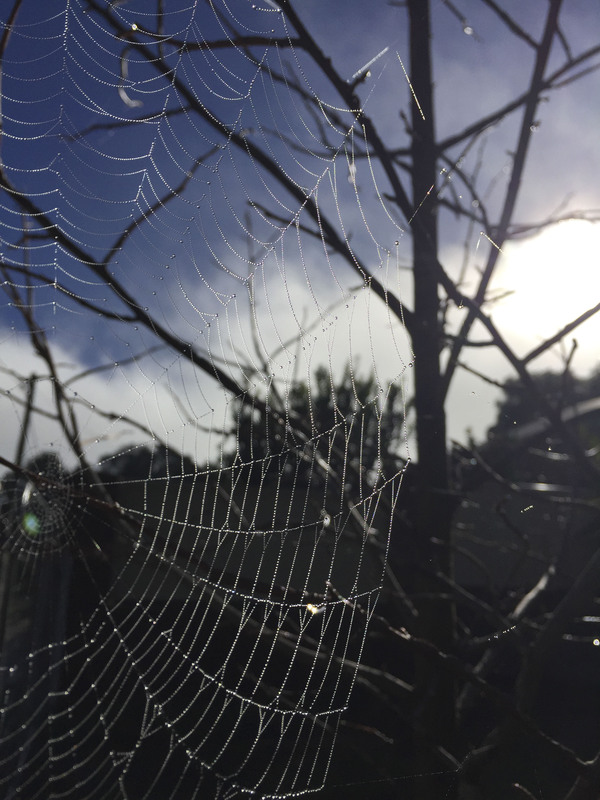 When I was attempting this task a few weeks ago I had a Kookaburra perched nearby that, every time I moved away, flew down to claim a wriggly meal. This week I started with the rake and spotted a worm. I remembered my friend from a few weeks ago, turned and there he/she was!!! We then worked together – to the detriment of the worms I’m afraid. I’d rake and move the wrigglers a couple of metres from the earthworks. Kooka would fly in from his/her varied perches and enjoy. The mystery to me was how he/she arrived just as was a feed coming way. Amazing. It bought back memories of growing up with the local Kookaburra family perching on the tennis court fence which faced our kitchen window. Mum would open the window and place slivers of meat on the ledge. Kooka would fly down, grab the bounty and return to the fence to kill the meat!!! then feed it to the baby, or gobble it up herself…this one had to be a she. 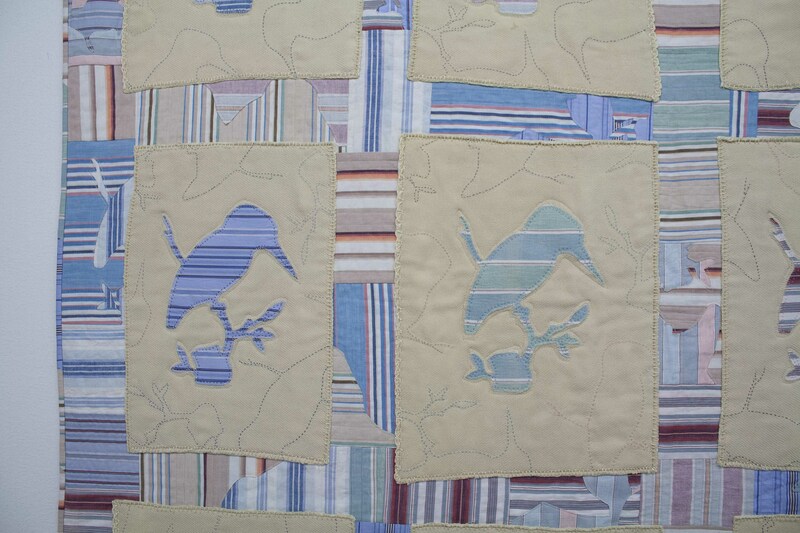 The quilt I made a few years ago ‘Kookaburra Lies” celebrated my mum, her family and her kookaburra call. 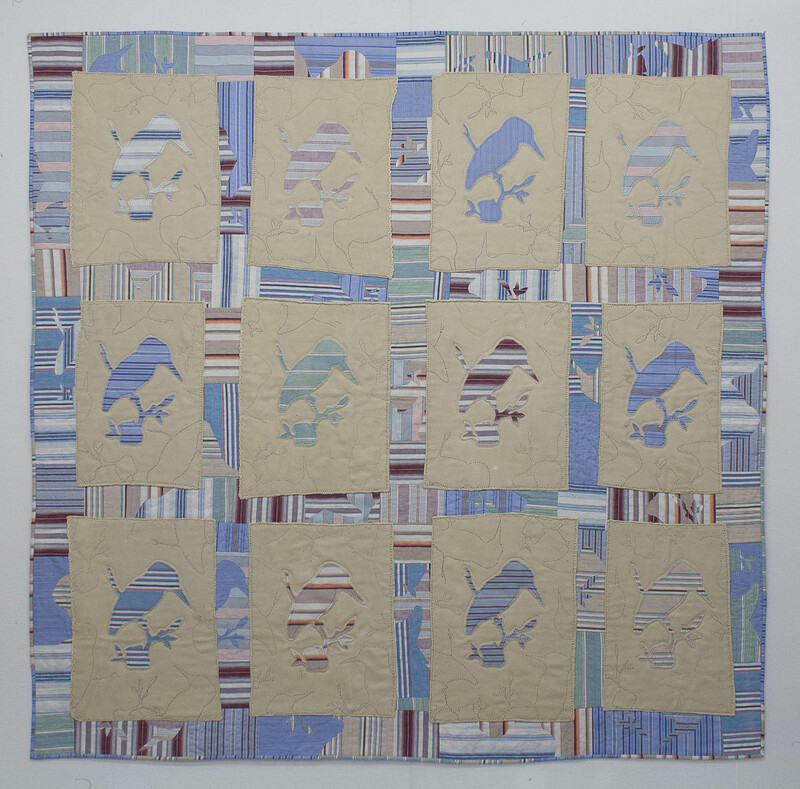 “This quilt started as a class sample. The Kookaburra image was sourced from a vintage children’s book – the class was about working with existing images – and was to represent my mum Betty who did the best kookaburra laugh. The blanket is from Mum and Dad’s bed – well used, never discarded. The striped fabrics are from Grandad’s (Graham Burgin’s) Linona shirt and pyjama factory which was in turn bought by Pelaco. I remember my brothers wearing Linona outfits. Mum also had some PJ bottoms, which I still have, made whilst she worked for Linona. So many connections, so many ways of revisiting ordinary, special times.